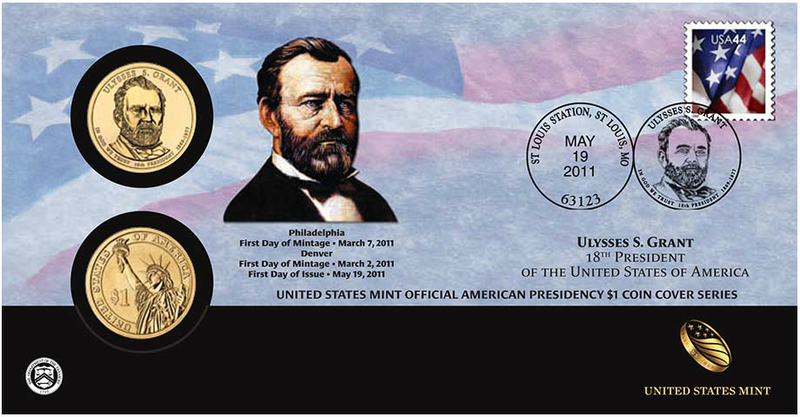 The 2011 Ulysses S. Grant Presidential Dollar represented the second issue of the year for the circulating dollar coin series, and the eighteenth issue overall. The official circulation release date was May 19, 2011. Prior to becoming President, Ulysses S. Grant had fought in the Mexican-American War under General Zachary Taylor. At the start of the American Civil war, he was appointed to command a volunteer regiment. He would eventually rise to the rank of General of the Army. He became the President of the United States in 1869 and would serve two terms. The memoirs written after his retirement as considered one of the greatest military autobiographies ever written. The obverse of the Ulysses S. Grant Dollar featured his portrait surrounded by the required inscriptions. Around the outer edge of the coin appeared his name, “In God We Trust”, “18th President”, and the years served “1869-1877″. 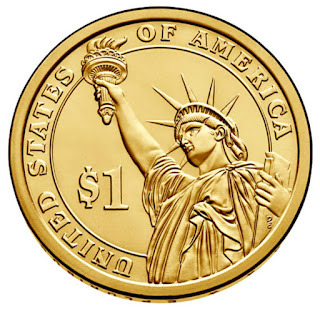 The reverse of the coin included an image of the Statue of Liberty with inscriptions “United States of America” and “$1″. United States Mint Sculptor-Engraver Don Everhart designed and sculpted both the obverse and reverse. The edge of the coin included incused edge lettering with the motto “E Pluribus Uum”, the year of minting or issuance, and the mint mark. A launch ceremony for the coin was hosted by the United States Mint and National Park Service at the Ulysses S. Grant National Historic Site in St. Louis, Missouri. The event was held on May 19, 2011 to coincide with the 148th anniversary of the Vicksburg Civil War campaign. In attendance were the US Mint Acting Deputy Director Al Runnels and Executive Director of the Ulysses S. Grant Association John Marszalek. Following the ceremony, free coins were given to children and others were allowed to exchange currency for 25-coin rolls. 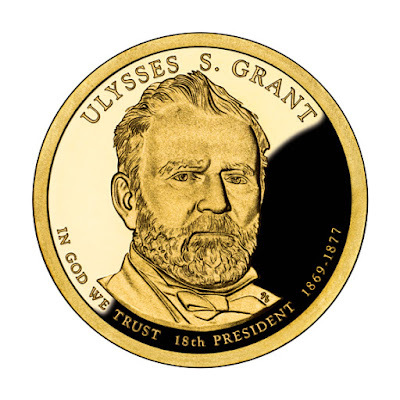 The mintage figures for the Ulysses S. Grant Dollar reflected an increase from the previous issue, with a total of 76,002,000 coins struck at the Philadelphia and Denver Mints. As one of the more well known Presidents, the higher production level may have been the result of greater anticipated demand for the specific design. 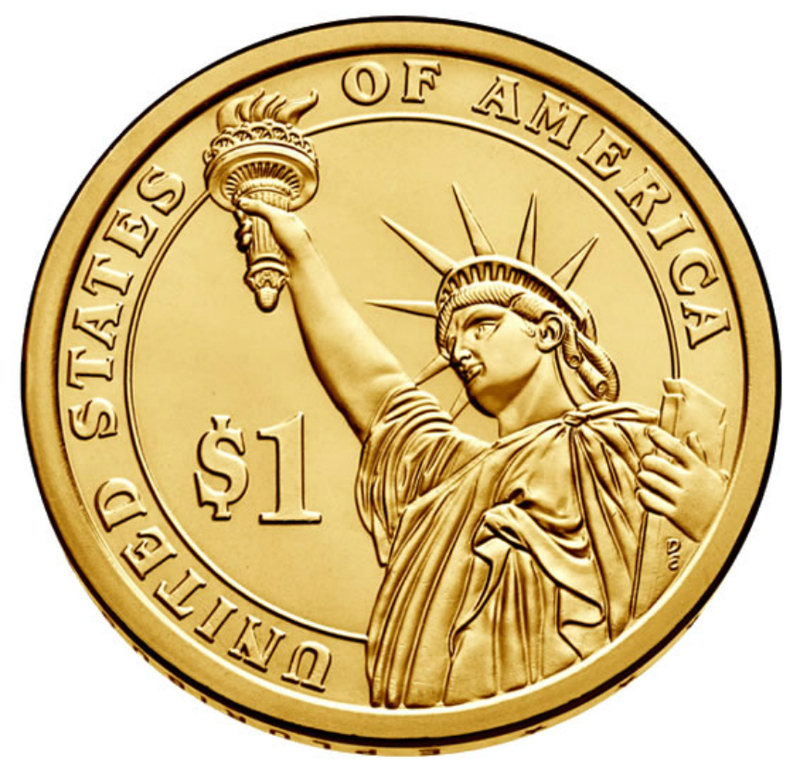 Besides availability through the channels of circulation, the coins will also be included in certain numismatic products offered by the US Mint. This included annual coin sets, numismatic rolls, and 2011 Presidential Dollar proof and uncirculated sets. 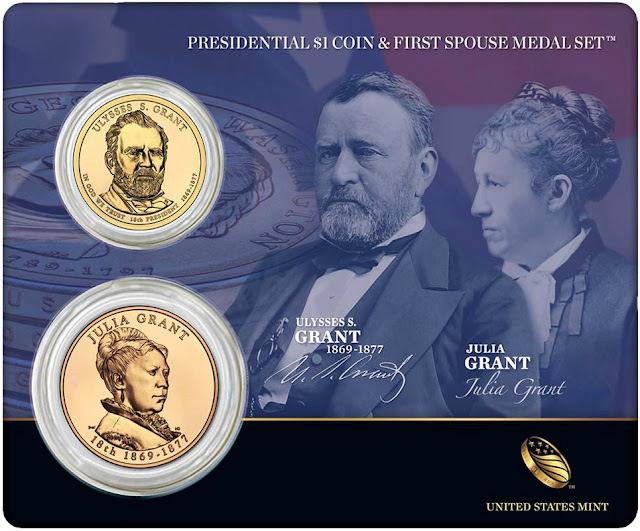 Ulysses S. Grant (born Hiram Ulysses Grant; April 27, 1822 – July 23, 1885) was the 18th President of the United States (1869–77). As Commanding General of the United States Army (1864–69), Grant worked closely with President Abraham Lincoln to lead the Union Army to victory over the Confederacy in the American Civil War. He implemented Congressional Reconstruction, often at odds with Lincoln's successor, Andrew Johnson. Twice elected president, Grant led the Republicans in their effort to remove the vestiges of Confederate nationalism and slavery, protect African-American citizenship, and support economic prosperity nationwide. His presidency has often come under criticism for protecting corrupt associates and in his second term leading the nation into a severe economic depression. Grant graduated in 1843 from the U.S. Military Academy at West Point, served in the Mexican–American War and initially retired in 1854. He struggled financially in civilian life. When the Civil War began in 1861, he rejoined the U.S. Army. In 1862, Grant took control of Kentucky and most of Tennessee, and led Union forces to victory in the Battle of Shiloh, earning a reputation as an aggressive commander. He incorporated displaced African American slaves into the Union war effort. In July 1863, after a series of coordinated battles, Grant defeated Confederate armies and seized Vicksburg, giving the Union control of the Mississippi River and dividing the Confederacy in two. After his victories in the Chattanooga Campaign, Lincoln promoted him to lieutenant-general and Commanding General of the United States Army in March 1864. Grant confronted Robert E. Lee in a series of bloody battles, trapping Lee's army in their defense of Richmond. Grant coordinated a series of devastating campaigns in other theaters. In April 1865, Lee surrendered to Grant at Appomattox, effectively ending the war. Historians have hailed Grant's military genius, and his strategies are featured in military history textbooks, but a minority contend that he won by brute force rather than superior strategy. After the Civil War, Grant led the army's supervision of Reconstruction in the former Confederate states. Elected president in 1868 and reelected in 1872, Grant stabilized the nation during the turbulent Reconstruction period, prosecuted the Ku Klux Klan, and enforced civil and voting rights laws using the army and the Department of Justice. He used the army to build the Republican Party in the South, based on black voters, Northern newcomers ("carpetbaggers"), and native Southern white supporters ("scalawags"). After the disenfranchisement of some former Confederates, Republicans gained majorities and African Americans were elected to Congress and high state offices. In his second term, the Republican coalitions in the South splintered and were defeated one by one as redeemers (conservative whites) regained control using coercion and violence. Grant's Indian peace policy initially reduced frontier violence, but is best known for the Great Sioux War of 1876, where George Custer and his regiment were killed at the Battle of the Little Bighorn. Throughout his presidency Grant was faced with charges of corruption in executive agencies, including congressional investigations of two cabinet secretaries. In foreign policy, Grant sought to increase American trade and influence, while remaining at peace with the world. His administration successfully resolved the Alabama Claims by the Treaty of Washington with Great Britain, ending wartime tensions. Grant avoided war with Spain over the Virginius Affair, but Congress rejected his attempted annexation of the Dominican Republic. In trade policy, Grant's administration implemented a gold standard and sought to strengthen the dollar. Corruption charges escalated during his second term, while his response to the Panic of 1873 proved ineffective nationally in halting the five-year industrial depression that produced high unemployment, low prices, low profits, and bankruptcies. Grant left office in 1877 and embarked on a widely praised world tour lasting over two years. In 1880, Grant was unsuccessful in obtaining a Republican presidential nomination for a third term. Facing severe investment reversals and dying of throat cancer, he completed his memoirs, which proved a major critical and financial success. His death in 1885 prompted an outpouring of national unity. 20th century historical evaluations were negative about his presidency before recovering somewhat beginning in the 1980s. Scholars rank his presidency below the average of other presidents. Grant's critics take a negative view of his economic mismanagement and his failed Dominican Republic annexation treaty, while admirers emphasize his concern for Native Americans and enforcement of civil and voting rights.